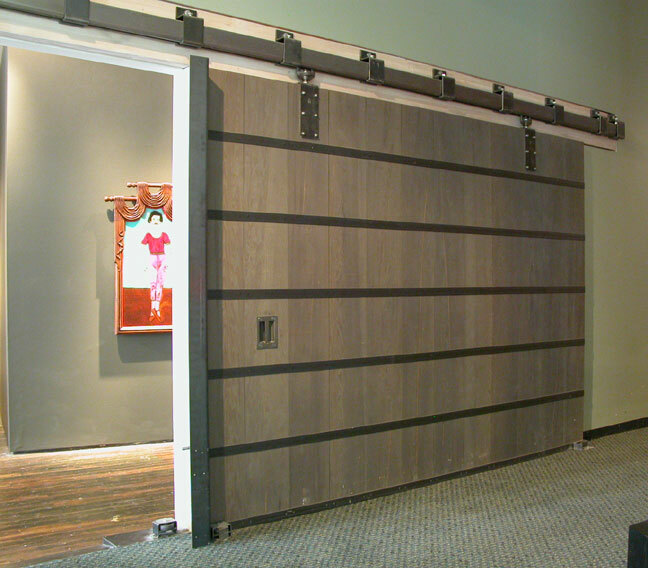 The interior spaces of homes are getting a makeover using flat track barn door hardware and other types of sliding and folding door track systems, as people desire more flexibility in defining the open spaces within their homes. While large, spacious, and open room floor plans are still widely popular with homeowners and home buyers, what interior designers are noticing is the desire to section off various areas, but without having to permanently alter the openness of the room. For instance, barn and loft style doors mounted to sliding rail tracks are a popular option to modify the layout of open spaces and redefine them as needed. The track systems can be designed in such a way so that the doors can be slid out of the way and hung parallel along a wall when they are not needed. The door tracks are secured to the ceiling of the room and can be installed to create a series of horizontal and vertical tracks, depending upon the needs of the homeowner and how much flexibility they want to resize the room. Another trend growing in popularity is using sliding or folding doors in between large openings in between rooms to provide privacy. For example, in homes where the dining room is connected to a hallway or the living room, it is becoming more common to install sliding or folding door systems in the opening between the two spaces. This way, the doors can be closed to give the room a more enclosed feeling. For homes with sufficient space in between interior walls, pocket sliding doors are a wonderful option. Pocket doors are hidden out of sight within an opening in between the walls when fully opened. This configuration is well suited for a variety of purposes and in homes with limited spaces where the homeowners do not want to lose any square footage taken up by traditional hinged doors. On the exterior of the home, split Dutch-style doors are becoming popular once more. This style of door used to be popular in the early to mid-1900s on homes across the country. The top half of the door can be opened to allow fresh air into the home, while the bottom half remains shut to keep pets or children safely within the home. Another exterior door trend is to take standard doors and finish them with different types of coverings and accessories, such as a dark colored ultra-gloss paint with stainless colored door hardware, and trim designs created using large nail heads. Some people are even experimenting with wallpaper and leather as door coverings on the interior sides of exterior doors. Last, in place of traditional patio and sliding doors, fully openable sliding and folding door systems are becoming more commonplace. To learn more about sliding, folding, and barn door track systems; hardware and accessories; or for help in ordering the right systems for your home, call RW Hardware at 800-253-5668 today!